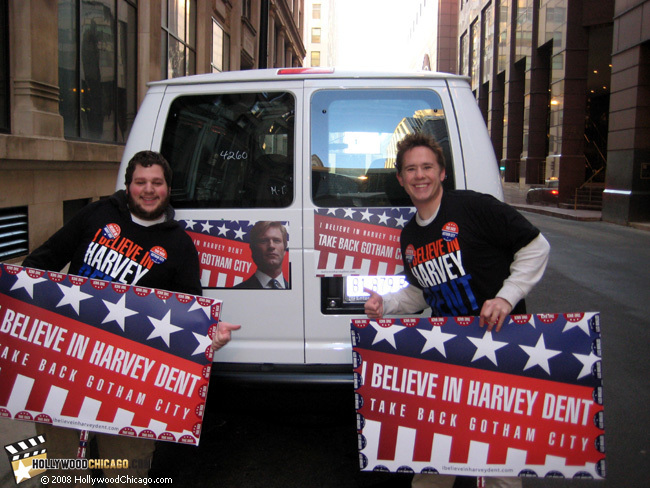 CHICAGO – As we reported would happen on March 12, 2008, “The Dark Knight” enthusiasts indeed congregated in Chicago (as others will across the country on various other dates on this “Dentmobile” tour) to show their fictional campaign support for Harvey Dent – played by Aaron Eckhart in the July 18, 2008 superhero monolith – running for district attorney. Those familiar with the film’s extensive viral marketing campaign enjoyed keeping “in character” and confusing uninformed Chicagoans who weren’t aware that the charade was actually in support of a storied politician within Hollywood. We feature below exclusive photos of the morning campaign from longtime HollywoodChicago.com source Vlkers54. The morning campaign, which was supposed to run from 8 to 10 a.m., was cut short due to a Chicago police breakup after three minutes flat. Vlkers54 has provided us with the following detail about the morning. Hey, Adam! Cops kicked us out! We kept “in character” and promoted Harvey Dent for [district attorney] as if he were a real person. Confusing people was a lot of fun. Some people did catch on to what was going on. Even middle-aged men who knew who [Harvey Dent] was were excited, [asked] for buttons and filled out the petition forms. It was a lot of fun, but let’s hope the cops don’t ruin the 11 a.m. and 4 p.m. sessions. I can’t make the 11 a.m., but I will be at the 4 p.m. trail. From 11 a.m. to 1 p.m., the Chicago campaign will be meeting at Jackson Street and State Street. From 4 to 6 p.m., the Chicago campaign will be meeting at the Canal and Madison commuter station. A full list of other viral marketing cities, locations, times and dates can be found here. 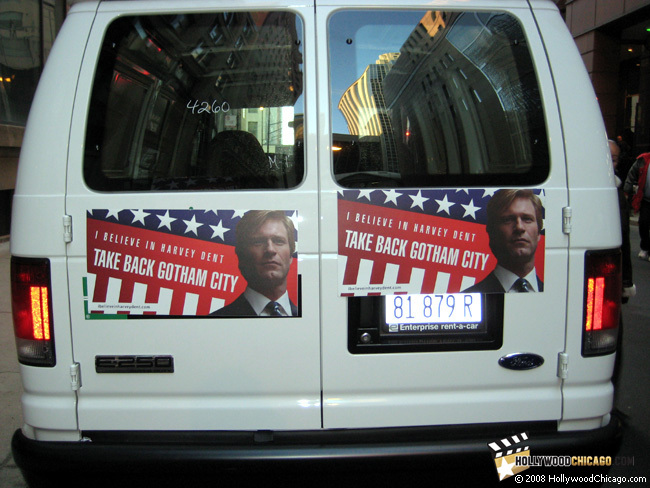 “The Dark Knight” viral marketing site IBelieveInHarveyDent.com is publishing photos like the above from across the U.S. here. Click here for our full “The Dark Knight” image gallery! 10:16 p.m. update on March 13, 2008: We have learned that yet another new viral marketing site for “The Dark Knight” just went live: GothamElectionBoard.com. Why? You guessed it. There will be an actual election process for Harvey Dent with real voter registration cards sent in the mail. See this comment below for more information. A screenshot of the new site is below. 10:43 p.m. update on March 13, 2008: When it rains in “The Dark Knight” land, it usually pours. We just learned of yet another new viral site related to this campaign: GothamCityClerk.com. It announces the formulation of competition for this election campaign and implies the launch of even more viral sites. Read more about this in this comment below. A screenshot is below. New official e-mail notification, hint of morning TV coverage! Submitted by HollywoodChicago.com on March 13, 2008 - 11:30am. The Dentmobiles Are Hitting the Road! Cross-Country Tour of Campaign Bus Continues as Thousands of Dent Supporters March, Rally For the One Man Who Can Save Gotham! Check the updated schedule here to see if a Dentmobile is coming to your neighborhood. Dent’s challenge to Gotham to show their desire for change has been met with a city-wide explosion of activism, with thousands of supporters organizing rallies, meet-ups, petition drives, and posting signs and placards in every neighborhood. Check out some of the best photos and videos here. Dent is expected to make his decision whether to run for Gotham District Attorney within weeks and your support does make a difference! For those of you who can get down to Rockefeller Center tomorrow morning between 6 and 9 am, there’s a very good chance your friends might be able to see you on a certain morning television show. Spread the word. Make an impression! Let’s get creative in demonstrating our support! Take Back Gotham! Submitted by HollywoodChicago.com on March 13, 2008 - 11:39am. I arrived at the ‘dentmobile’ at about 7:35. It was a white van with Harvey Dent posters on it. There were two ‘campaign managers’ and another fellow Dent supporter (the same person who got the cake phone, he’ll be submitting photos sometime). We got stickers, buttons, and t-shirts to be street promoters. We waved picket signs. At 8 a cop came up to us and said we had to go. The managers cooperated and left. They said they would be at the later stops. The “cake phone” person Tony refers to in this e-mail is Vlkers54. See our earlier “The Dark Knight” cake phone coverage here. Submitted by Anonymous (not verified) on March 13, 2008 - 2:05pm. I got to the 11:00 one at Jackson&State at 11:35 and there was nothing there. One guy hanging around said that he had been there since 11:15 and it was broken up before he even got there. I don’t understand why people can’t hand out free stuff for a movie, while I get solicited by homeless and stupid organizations every 9 feet. Submitted by HollywoodChicago.com on March 13, 2008 - 2:14pm. I’d be really interested in hearing from a lawyer about this. I don’t understand why this would be illegal or why cops would need to be breaking this up. Even protesting is legal so long as it doesn’t get roudy. But this? This is just drumming up interest for a movie. Why do Chicago cops have the right to prevent that? p.s. to the comment below. Submitted by Anonymous (not verified) on March 13, 2008 - 2:06pm. p.s. I’ll also be attempting the 4:00 one, but showing up at 3:30. Submitted by HollywoodChicago.com on March 13, 2008 - 3:03pm. 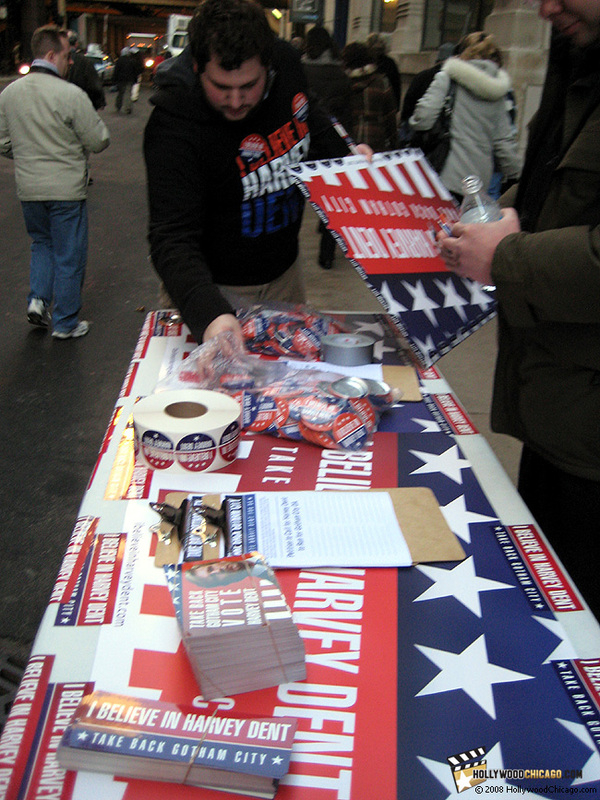 The second attempt by the campaign managers in Chicago went largely without police interruption. By the time the dentmobile got to Jackson and State, about 5-10 of us were waiting. When it arrived, people came out of the woodwork to get the free stuff and promote Harvey Dent. We were being filmed as probably around 20 of use stood on the sidewalk chanting ‘Take Back Gotham’ and ‘I Believe in Harvey Dent’. It was very fun to partake in a Dent rally. We spent about 20-30 minutes screaming and chanting then we broke up. This new account is in contrast to a first account on the 11 a.m. campaign that came in earlier. Submitted by Tom (not verified) on March 13, 2008 - 10:15pm. Alright, so I’m going to the Madison one tomorrow, and I just want to know if everyone gets free shirts, or how you go about getting one exactly. Submitted by HollywoodChicago.com on March 13, 2008 - 10:22pm. New site! Keep an eye on it! 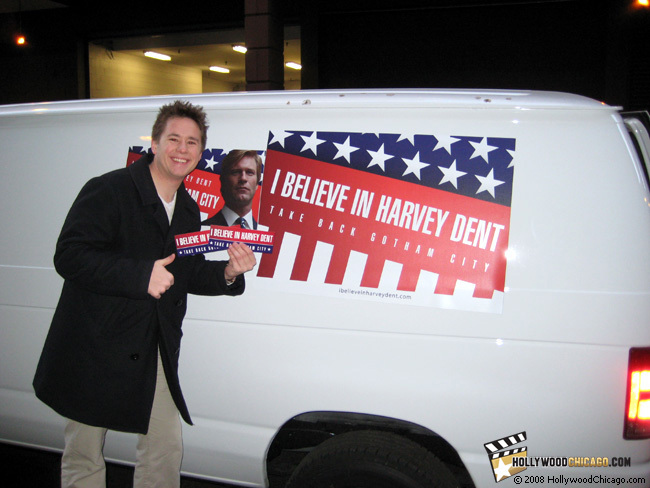 Also, Not sure if you knew, but if you submit a picture on ibelieveinharveydent.com, you receive a voter registration card in the mail. I saw that someone on a different site got one and put up a scan so we could see what it looks like. When I get mine, I will send a picture to you. They apparently assign you to a specific “voting district” for voting in June. I am in the “Sheal” precinct. You can see the map of Gotham voting precincts on this page if you scroll to the bottom..of course it’s the link to my pic on the site but scroll down below it and you will see what I’m talking about. It appears they will actually be having us vote for Harvey in June….hmmmm….interesting. Submitted by Anonymous (not verified) on March 13, 2008 - 10:37pm. Submitted by HollywoodChicago.com on March 13, 2008 - 10:28pm. This implies to me that we’ll be seeing more viral sites for the candidates for mayor plus one for Roger Garcetti.